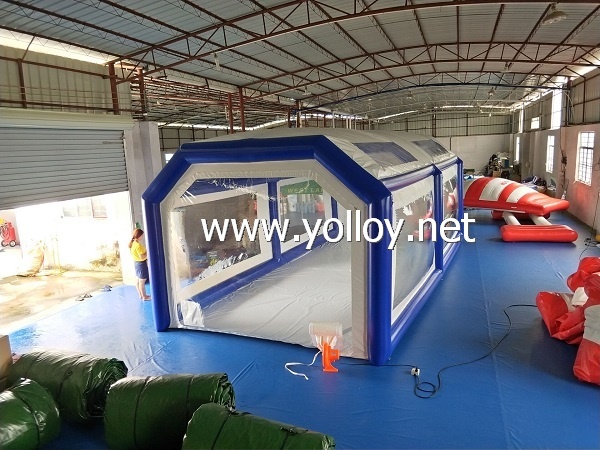 Inflatable Auto Soda Sand Blasting Tent is specially designed as a mobile car garage, you can use it as a mobile car maintenance station, or spray-paint for cars inside. Or just simply use it as a car shelter. It is easy to set up and deflate. 1. Our inflatable shelter tent is made for mobile detailers. It sets up in a matter of minutes. With an inflation time of just few minutes you will be up and running fast in any weather conditions. 2. With an inflatable garage you won't lose word days due to rain, snow, or wind. It also gives shade on hot and sunny days. While your competitors are stuck home in bad weather you will still be out getting the job done. 3. A custom door will attach right to your work truck giving you easy access to your tools. Other options include windows, sandbag holders, and banners on the outside of the tent. Below more photos in different colors produced by us.